I remember back when I was a lot younger than I am today, when there were giants in the NBA, and they dominated the league. 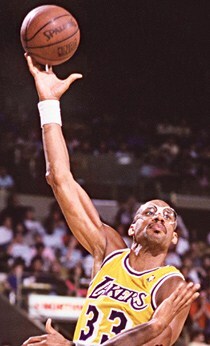 Does anyone remember Wilt “the Stilt” Chamberlain (7’1″), or Kareem Abdul-Jabbar (7’2″)? These were two of the best basketball players of all time, as well as two of the tallest in their era. It got me wondering just how many really good players in the NBA have been 7′ or taller? Kareem and Wilt seem to be anomalies instead of the norm, as there have been many more disappointing big men in the NBA, than Hall of Famers. Out of the 50 Greatest Players in NBA History (voted in 1996), there are only 7 who measured 7′ or taller. The two I mentioned above, as well as Robert Parish, David Robinson, Shaquille O’Neal, Patrick Ewing and Hakeem Olajuwon. It seems as though the average is just over one (1) NBA Superstar over 7′ tall every 10 years, as you can see below. The NBA isn’t getting any smaller, with 44 players on the 2010 active rosters in the NBA that are 7′ or taller. I am sure back when Wilt first started playing in the NBA, he was probably the only one taller than 7′. Out of the 44 seven footers currently in the NBA, are any of these giants any good? Well twelve (12) 7 footers out of the 44 have averaged over 10 points per game throughout their career. Only two (2) have averaged over 20 points per game over their career, and only five (5) have been in the league ten years or more. Since the NBA Selected the 50 Greatest Players in 1996, how many big men have come into the NBA and dominated? I can only think of one that has had a long, successful career, and that is Dirk Nowitzki. If you look at the top 20 players who averaged the most points per game, Wilt Chamberlain (#2), Kareem Abdul-Jabbar (#15), and Shaquille O’Neal (#19) are the only 7 footers on that list. I also checked the top 20 players who averaged the most rebounds per game, and Wilt Chamberlain (#1) was the only one 7′ or taller on the list. So I ask, why is there so much emphasis on height in the NBA, when there have been less than 10 great basketball players taller than 7′ in the 64 year history of the NBA? That averages out to less than one great 7′ tall player in the NBA every 6.4 years, yet there are 44 7′ tall players currently in the NBA. You would have thought that if height was such an important factor in how successful your career in the NBA would be, there would be a lot more superstars and Hall of Famers that were 7′ or taller. When it comes right down to it, height isn’t all it’s cracked up to be, at least in the NBA. ~ by Troy Erickson Realtor on November 5, 2010.